Getting the most out of taking pictures with the iPhone, that is pretty much what this blog is about. The maximum is up to the user’s opinion. Some folks want the iPhone camera to be more like something else. They miss their film camera, they want better ways of sharing, they like the retro days, they want what they get out of their high end digital camera… the list goes on. In this case, how does one get more robust photos through the iPhone’s camera, prior to any edits or special effects. 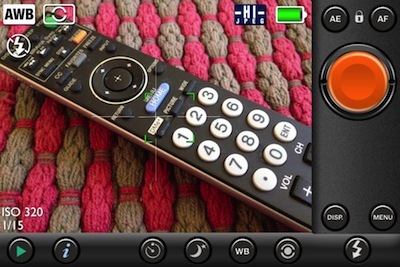 Most editing apps offer their own doorway to the camera so that editing avoids extra steps. In the case of the 645 Pro app, it is all about getting a better shot to work with somewhere else. I found myself liking the features but hating the interface. The app attempts to mimic my physical camera with images of buttons to use for adjusting and every little fact about the photo capture happening is over laid on the view finder. To help others in my situation, 645 Pro’s developers released PureShot. At first, I didn’t look beyond the app description as I saw it as a new app doing less than their earlier app, yet charging full price. Why not just have the ability to go ‘lite’ with the current? Once I got past what appeared to be a way to get more money out of people who already bought… I plunked down my hard earned cash and dove into a day with PureShot. As promised, the view finder has far less clutter. Just the basics I need to get more from a photo being taken. 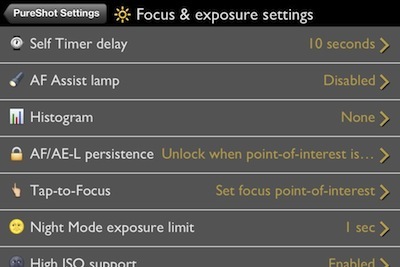 Selecting and locking focus area has become standard for iPhone camera apps, good to see it’s on/off and use is quick and easy. As is the whole app, set up the preferences for shooting going forward, the app launches ready to start that shooting very quickly. 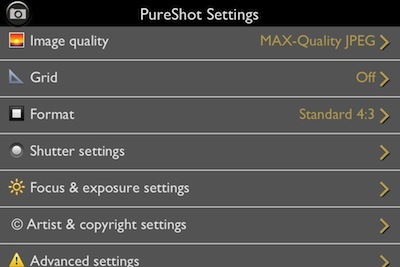 PureShot offers many fine tuning features to get the most out of the actual photo taking experience. While the settings are easy to get to and quick to adjust, the power is more about getting things tuned the way you like and leaving alone. Like I mentioned, the view finder is cleaner and the app launches quickly so I spend my time getting the shot right rather than worrying about spinning dial. Making PureShot more like a built-in app than an add-on. Format setting 4:3 or 1:1 means framing on a street walk is shot for how it will be used later is one less thing to worry about. The photo social sharing world get a bit excited when Instagram recently mentioned they may start using your uploaded photos in their ads without crediting your photography efforts. One solution has been for folks to start adding a Copyright to their photos. This isn’t just for Instagram uploads, imprinting your copyright on photos is an effective way of keeping your work yours no matter where you share. Everything you need to know about the features, icons and settings is available via the built-in manual. 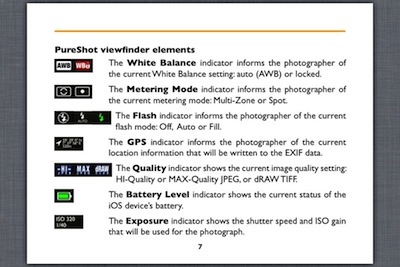 PureShot makes it available through the ‘i’ button along the bottom of the view finder screen.